Vegas sportsbooks have proven their handicapping acumen time and time again. Assuredly, they have a meaningful edge in predicting NFL game flow. So how can we best exploit their effort for our fantasy gain? Even the fantasy layman understands that you shouldn’t expect a four-plus touchdown performance from a quarterback in a low Vegas total game as a double-digit road underdog. While that scenario may be intuitive enough, most other game scripts are not as cut and dry. 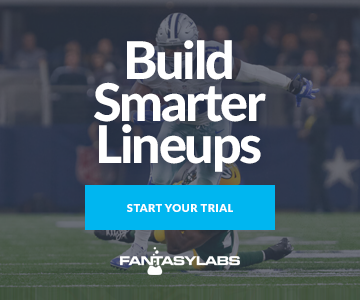 So, how do we optimize Vegas spreads, over/unders, implied team totals, moneylines and public betting percentages (among other metrics) to identify fantasy value plays? Luckily for you, we have built these metrics into our Trends tool and developed our own proprietary metric to evaluate all Vegas-based factors: Vegas Score. Vegas Score is a percentile-based metric that combines point totals, moneyline, line movement, etc. into a single score representing a player’s intrinsic fantasy value based on Vegas lines for an individual game. Accordingly, I’ve filtered each fantasy position into categories based on their Vegas Score percentile to demonstrate how Vegas Score affects fantasy performance at each position. The quarterback position shows the strongest correlation between Vegas Score and fantasy performance among the four position groups. There exists almost a perfect statistical correlation between Vegas Score and Avg Actual Pts, Plus/Minus, Consistency and ownership — all of which boast correlational coefficients in excess of 0.80. Quarterbacks with Vegas Scores above the 70th percentile feature positive Plus/Minus splits and nice Consistency percentages. However, these quarterbacks also tend to have higher ownership, as you might expect. Similarly but conversely, quarterbacks with low Vegas Scores feature negative Plus/Minus splits. At the very bottom of the sample, quarterbacks with a Vegas Score below the 9th percentile have a Plus/Minus of -2.23. The results for running backs are incredibly noisy. Vegas Score has a strong correlation to Average Actual Points, but Plus/Minus results seem to be all over the place. In general, running backs with a Vegas Score below the 29th percentile do not boast positive Expected Value. However, it isn’t until the 90th percentile of Vegas Score that we witness a definitive boost to running back value. This statistical ambivalence makes some intuitive sense, of course. Running back, more so than any other position, operates outside the flow of the rest of the offense. Whereas there is a natural correlation between quarterbacks and tight ends or wide receivers, running back production is more isolated. Considering the propagation of pass-heavy NFL offenses, the running back position is affected far less by Vegas metrics. Take these results with a grain of salt, but maybe throw out a flier on a top 90th percentile Vegas Score running back to gain exposure to his +0.87 historical Plus/Minus. Similar to the running back position, our wide receiver results carry substantial statistical noise. The one result we can point to with confidence is the -1.02 Plus/Minus result for wide receivers with a Vegas Score below the 9th percentile of NFL games. These wide receivers should be avoided in most fantasy lineups. There are also no wide receivers who fit our trend this week. The distribution for tight end is also all over the place. Tight end is a low-volume, high-volatility position to begin with, and Vegas Score does not seem to have a systematic effect on player production. In general, tight ends average more points with higher Vegas Scores, but this tier inconsistently compared to its Average Expected Points. Meanwhile, Consistency and Plus/Minus seem mostly random, perhaps with a subtle positive correlation with Vegas Score. For our purposes, it’s safe to search for tight end fantasy edge by using other metrics besides Vegas Score. Much like quarterbacks, fantasy defenses have very clean Plus/Minus splits related to Vegas Score. Defenses with Vegas Scores below the 29th percentile feature negative Plus/Minus splits and low Actual Fantasy Points production. Meanwhile, defenses with Vegas Scores above the 70th percentile boast a high Average Actual Points and Plus/Minus scores in excess of +1.00. When it comes to Vegas Score, quarterbacks and defenses are by far the most predictable fantasy positions with almost perfectly inverse correlations to each other. Target quarterbacks against low Vegas Score defenses, and conversely, target defenses against low Vegas Score quarterbacks.